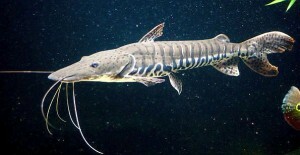 The Tiger Shovelnose Catfish (Pseudoplatystoma fasciatum) also known by tropical fish keeping enthusiasts as the Tiger Catfish, is found in various rivers and tributaries in South America. It prefers deeper waters in the main river channels but can be found in lakes, flooded forests and other freshwater areas. The Tiger Shovelnose Catfish is long and slender with a beautiful silver coloration over it’s entire body. Its body is covered with black stripes and spots which give the fish a tiger like appearance, hence its name. The Tiger Shovelnose Catfish has a long flat shaped mouth that is adorned with very long whiskers. These catfish grow quite large in captivity (over 3 feet) and require at least a 180 gallon aquarium to keep them happy and healthy. They are active and should have a tight fitting tank cover to prevent them from jumping out of their tank. Because of its impressive size, the Tiger Shovelnose Catfish should only be housed with larger fish. Their tank should be densely planted with rocks and driftwood to simulate their natural environment. Not much is known about the breeding habits of the Tiger Shovelnose Catfish, but the females have fuller stomachs and a wider overall shape. The Tiger Shovelnose Catfish is not a picky eater. In their natural habitat they are voracious feeders and prey on fish and crustaceans. In an aquarium environment, feed them different types of worms, small fish, sinking catfish pellets, and frozen foods. When available for purchase they are usually only 4″ to 6″ but they grow quickly. For this reason they should be kept in a single species tank or with other much larger fish.